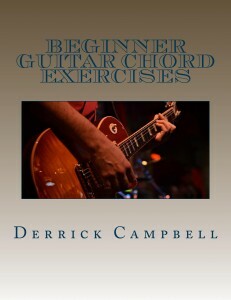 Book includes guitar chord exercises for beginners, scales and arpeggios, and more! My method book, “Beginner Guitar Chord Exercises” teaches you how to play simple chords on guitar that you can use to play songs you know by current artists. The first group of chords that you’ll learn are the open chords like E major, A major, D major, and G major. Once you know those 4 chords, there is a list of songs on this website that you can play using those chords, and chords of similar difficulty. All of the songs are by popular bands, but might be somewhat obscure, like Desolation Row by Bob Dylan. Other songs on the list are more popular, like Bad Moon Rising by Creedence Clearwater Revival. The actual song transcriptions are not included in the book as that would be a violation of copyright laws, but you can purchase the sheet music at websites like sheetmusicdirect.us or musicnotes.com. The next chord that you’ll learn is C major, and once you know that chord, there is another list of songs that you can play by current artists. the last two steps are learning F major, and then B minor. At the back of the book are the pentatonic and diatonic scales I teach to my students, as well as some advanced scale exercises. This book is useful for beginning guitar players, especially those who have taken a few lessons and then quit because they thought it was too hard. One of the most common complaints I’ve heard from my students who have taken lessons with a few different teachers, is that they were asked to learn 10 different chords – including barre chords – in their first lesson. If this has happened to you, you should buy this book and then either contact me for lessons if you live in the area, or send me an email and ask for a program of what to work on in the book, and how long to spend on each step. This book is also a good companion to the Hal Leonard or Mel Bay method books as it doesn’t teach standard notation like those methods do, but is much better at introducing beginners to chords. The book costs $10 (plus shipping), and can be purchased from Amazon’s CreateSpace by clicking here.